One evening on this recent trip was gorgeous – so right after dinner I was scampering around trying to find images to make. 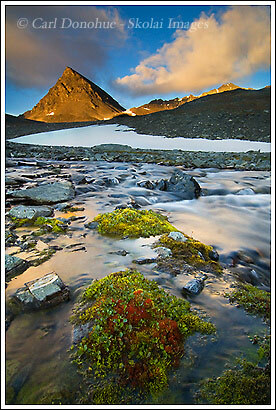 The peak behind camp was glowing in the setting sun, and I set up along a small stream by our ‘kitchen’. This is the view east from dinner. Unfortunately, we didn’t get too many evenings like this, and this was the only we did where our camp was in a spot I could shoot something from. One evening later in the trek was simply amazing, but we’d had to camp in the middle of some brush up a small tributary stream, and compositions weren’t working for me. This entry was posted in Adventures, Alaska, Backpacking and Hiking, Landscapes, Travel, Wrangell - St. Elias National Park on August 28, 2008 by Carl D.
Great shot Carl. So that’s what you were doing camped down by the stream for so long. Thought you were just soaking your feet. Holy OP Cover! Dude, this is up there with a Galen shot. Could easily see this fitting in with a cover of Outdoor Photographer. Thanks so much for the wrap, man, I appreciate it. I was studying this pic again, because it is so beautiful. This is just breathtaking, it really is. There’s really nothing one can say about this picture, it conveys everything!!!! I wonder what would be left to photograph after seeing these amazing pictures you capture Carl :)….Even if you took me to the same spot and asked me to take this shot, I doubt if I could get the composition you have here. Fantastic!!! Thanks again for the kind words, I appreciate it. I was so lucky to get some decent light in this location. Killer campsite!